From those of us at Unclutterer, we wish you a calm and clutter-free holiday season! Keep your food waste to a minimum by using these five tips. In our third installment of Unclutterer’s 2009 Holiday Gift Giving Guide we’re discussing gifts of knowledge. To get us all into the Thanksgiving holiday spirit (and those of you outside the U.S., feel welcome to laugh along), I present to you synthetic Lucky Break Wishbones in packs of 4, 5, 8, or 10 wishbones! Whatever holidays you celebrate — at this time of year, or any other time — you may choose to include decorating as part of the festivities. Here are some ideas about holiday decorations that might resonate with you. One of the best holiday gifts I’ve given was a small wooden armadillo, which became part of someone’s Christmas crèche. I knew the recipient well, and knew she had a beloved crèche with an eclectic collection of animals in attendance. Holiday decorating styles vary wildly; some people do minimal decorations, or none at all, while other go all out. Some use a color theme, and others have a wild mixture of items they’ve collected over the years — each item bringing back memories of people or places. So for the right people, a thoughtful addition to their holiday decorations may be a welcome gift. And a note of caution: When selecting holiday décor for yourself or others, please be sure to be child-safe and pet-safe. The Pet Poison Helpline will help you avoid plants that are dangerous to cats and dogs. And the Consumer Product Safety Commission has a publication, in PDF format, listing holiday decoration safety tips. Did you do really like the way you arranged certain decorations this year? Be sure to take some photos, so you can easily replicate the arrangement in the future. For those who like “real” Christmas trees, but not the time it takes to go cut your own (or the fire hazards of trees that dry out too quickly), you might choose to rent a tree. There’s a place in San Jose, Calif., that leases living Christmas trees; you can even get the same tree year after year. Another place rents trees in San Diego, Los Angeles County, and Marin County. There may be a similar place near you. If you have holiday decorations sitting around that you aren’t overly fond of, passing them on to someone else usually works best when done before the holiday. I’ve just freecycled a large number of Christmas items — wreaths, ornaments, hand towels, lights, and figurines — that I’d have a much harder time placing in January. This would also be a good time to donate such items to a thrift store that benefits a good cause. And a fun idea I just read about is to have an ornament exchange party. So as you’re pulling decorations out of storage, consider taking some time to pass along those you’re no longer excited about putting on display. This year we thought we would ask a few professional organizers from around the world what their favourite gifts were to give and/or receive. Erin Rooney Doland of Unclutterer.com in the Washington, DC-area, suggested the Cubitec Shelving System. Geralin Thomas of Metropolitan Organizing, LLC in Cary, NC, is a fan of supplemental battery power for her smartphone. She would love to receive an Everpurse this holiday season. The Everpurse is a purse that charges your smartphone. Leave your purse on its charging mat all night and it will keep your smartphone charged all day. Geralin loves also the Purse Perfector purse organizer she received as a gift and keeps it in the centre console of her car to keep everything in its place. 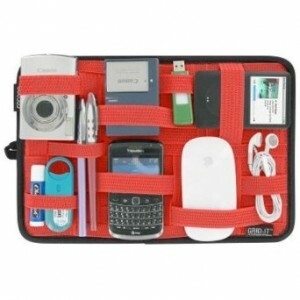 Julie Bestry of Best Results Organizing in Chattanooga, TN, recommended Grid-it by Cocoon to organize and maintain cables, chargers, ear buds, pens, small tools, flash drives, and just about anything that would otherwise be lost in the bottom of backpacks and purses. Julie would love to receive the Cocoon Backpack with its ability to hold a 17” laptop and its multi-pocketed organized interior and ergonomically designed shoulder harness. For those who want to have their files accessible from anywhere, but don’t feel comfortable hosting them in the cloud. Brooks Duncan of DocumentSnap in Vancouver, Canada, recommended the Transporter Sync. It lets you turn your external hard drive into a secure, connected, cloud device that is in your control. Some people have small homes and it can be hard to accommodate Christmas trees in the living room during the festive season and in storage spaces the rest of the year. If this is the case with your friends or family, Soraiya Kara of POSabilities Personal Organizing in Vancouver, Canada, suggested giving ornament display stands. These stands come in a variety of styles and a range of prices and allow people to display their beautiful, sentimental ornaments. 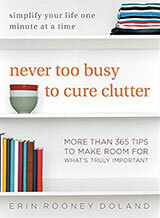 Janet Barclay of Organized Assistant in Hamilton, Canada, suggested the book Time Management for Unmanageable People: The Guilt-Free Way to Organize, Energize, and Maximize Your Life by Anne McGee-Cooper as a gift for those creative types for whom time management may be a challenge. As a right-brained individual who has overcome traits of dyslexia, hyperactivity, and attention deficit disorder to become a successful author, lecturer, business consultant, creativity expert, and business owner, McGee-Cooper knows her subject matter well, and presents her information clearly and with a sense of humour. Patience Oaktree organizing novels and books of short stories are fictional stories about the adventures of a professional organizer. Valentina Sgro of SGRO Consulting in Cleveland, OH, suggested these books as a gift because they don’t run the risk of implying, “Happy Holidays! You’re a mess!” And, organizing aside, they make entertaining reading for most anyone. Want more gift-giving ideas? Explore Unclutterer’s full 2013 Holiday Gift Giving Guide. This is truly one of the worst ideas for a product we’ve ever seen. Directions from professional archivist Sally Jacobs on how to preserve heirloom-quality photographs. Doctors can be intimidating, even those with amazing bedside manners. It can be easy to be anxious and/or timid around them — especially when they’re wearing those impersonal white lab coats. A little organizing can help reduce these anxieties. What are the five books you should read to learn as much as possible about a specific subject? Five Books has the answer. There aren’t many gifts more practical than grooming items. All of these items are utilitarian and functional, but are luxurious enough that they’re likely not something a man in your life will routinely buy for himself. You can pamper him, and know the gift won’t clutter up his space. A kit can be an extremely practical gift, one that could make a real difference in an emergency situation. This past week, I encountered two fantastic articles on Lifehacker I wanted to share with you. Is ‘user-friendly’ and ‘intuitive’ software really simpler? Should software developers expect more from end-users? There are numerous things to love about Elisabeth’s space, but one of my favorite things is that the vast majority of storage is behind closed doors. If you have a job that requires a great amount of equipment, the equipment is likely not very attractive to have out on display. When you can put those items away (and, hopefully, you put them away in an organized manner) you reduce the number of visual distractions to bother you as you work. I also like the storage unit next to the desk that extends the work surface of the desk tops. This extension makes it easier to spread out all your necessary supplies and papers when in the process of working. Thank you, Elisabeth, for sharing your workspace with us. Consumables can make fine clutter-avoiding gifts for almost any budget. As with any gift, you’ll need to consider your recipient — not everyone drinks alcohol, some people have food allergies, etc. But match the right consumable to the right person, and you’ve got a winner. For non-alcoholic beverages, there’s always a good coffee or a special tea. A cook might appreciate a nice olive oil; David Lebovitz recommends Arbequina. But really, the possibilities are endless: fancy salts, a special peanut butter from the Netherlands, heirloom beans, and so much more. Know people who like growing their own food? Consider a seed bomb, or some specialty seeds. 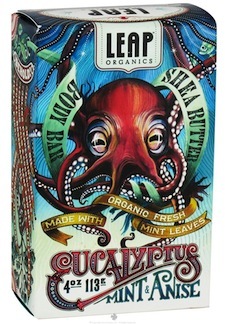 For people who like bar soap — and appreciate magnificent packaging — you might get the soaps from Leap Organics: eucalyptus, mint, and anise is one of their three options. Another interesting choice would be the soaps from Badger, sold by Soap Hope, which say: When you purchase any item from Soap Hope, we invest ALL profits — every single dollar — into programs that empower women to lift themselves from poverty. All sorts of seemingly mundane products can be more fun than you might expect as a gift. Items like bacon bandages, Abraham Lincoln bandages, or Jane Austen bandages are fun for restocking a first-aid kit. You can get organic toothpaste from Denmark in a number of flavors, or cinnamon mint toothpaste from Italy. And you can even get interesting dental floss. There are plenty of interesting lip balms, such as the Coast of Eden assortment: chai spice, lavender mint, blood orange, and peppermint. Or you could get a do-it-yourself lip balm kit. I’m always amazed at the wonderful products available in this category; just make sure whatever you purchase is safe for the child’s age. Consider edible veggie sidewalk chalk, made with organic ingredients. 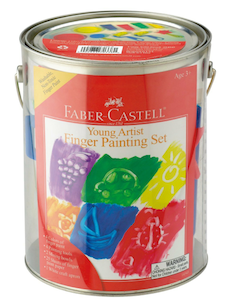 Or, consider Snazaroo face paint, the Faber-Castell Young Artist Finger Painting Gift Set, and Glob natural botanical paints. And, there’s a fun-looking set of eco-crayons and an eco-art pad. For something different in sticky notes, take a look at Leaf-it. For example, you can purchase their maple leaf sticky notes. And how about some colorful staples: pink, blue, purple, or teal? Trying to figure out what presents to buy this holiday season? Use our 2012 Gift Giving Guide to find helpful and fun products your friends and family are bound to use and enjoy. Dave has created a list of his favorite organizing and productivity software to help you or a loved one manage time well in the new year. The list of unitaskers available for your computer’s USB ports just got a little bit longer thanks to the extremely necessary USB-powered Hamster Wheel. Until yesterday, I had no idea that chalk wrote easily on matte-finish oilcloth. The concept is so basic, yet its implications have my head spinning. I’m no longer trying to think of ways to decorate my Thanksgiving table, entertain the kids during mealtime, or am worried about a centerpiece — I have my solution. Maybe it’s me, but I get as much enjoyment from buying and imagining my kids’ reactions to opening gifts as I get from witnessing the unwrapping itself. As a result, Erin assigned me the task for putting together the shopping guide for kids for this year. I’ve collected a number of gift ideas for kids of various ages and interest, from toddlers to teens. And, each of these gifts has a special organizing slant, of course. Foldie T-shirts. I am flat-out in love with these. The Foldie “educational” tee is very cute. The shirts feature adorable graphics and they have a secret. Specifically, they teach kids how to fold shirts in a very clever way. Flip it over and bring the sleeves together, and the image on the back becomes a whole new picture. Fold it again, bringing the bottom to the top, and a third image is created. It’s utterly delightful. I tried one out with my own kids and, not only did they love it, the lesson generalized to non-Foldie shirts. Perfect. The Swoop Bag. The fantastic swoop bag serves three purposes. First, it’s a play surface. 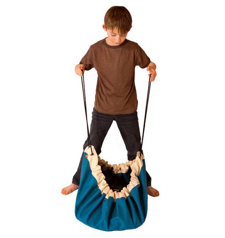 When fully opened, this sturdy bag makes a great area for playing with LEGO bricks, wooden blocks, and so on. Second, it’s fantastic for storage. When playtime’s over, just zip! It’s closed. Use the built-in straps to close or hang it up. Finally, it’s super for transportation. My son has a mind-bending number of Skylanders figures which he brings to his buddy’s house. The Swoop Bag is a great way to transport them. Rainbow Loom. It’s a clever little device that lets kids make all sorts of bracelets with elastics. My kids sure love it, and that means I find tiny rubber bands all over the place. Keep them tidy with a multi-compartment container. It also helps kids more easily transport their “loom gear” to their friends’ houses. A can of chalkboard paint. Stay with me here. Last Christmas, we gave a pint of chalkboard paint to the kids, whose initial reaction was hesitant. A year later, they absolutely love it. My son is always changing the “art” on his wall, while my daughter has taken to using her wall as a calendar. She’ll note down what’s happening on a given day, like “ballet” or “play practice.” She draws goofy faces, too, but that’s the fun. Slap some on the wall, hand them a box of fresh, colorful chalk, and let them go wild without any paper mess cluttering up their spaces. 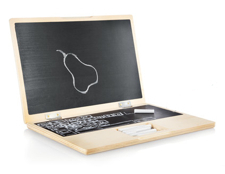 The chalkboard laptop. Seriously, how adorable is this? This handmade, wooden “laptop” features a chalkboard screen and keyboard, plus a slot for chalk where the trackpad is on mom and dad’s laptop. The whole thing folds up for easily for travel and storage, just like its computer counterpart. The crayon bandolier is adorable and handy. First of all, it’s super cute. And, secondly, it keeps crayons ready to go and not all over the table or floor. The Doodle Tablecloth. Since you’ve got the crayons out, break out the Doodle Tablecloth to complete the set. This lined tablecloth is machine washable and ships with a pack of eight washable markers. If you’re not willing to subject your entire tablecloth to Jr.’s artistic endeavors, consider the Doodle placemat set. Here at Unclutterer, we make weekly jokes about unitaskers — items with only one purpose and very little utility tied to that purpose. However, there are useful unitaskers, single-purpose items with high utility, that can make great gifts for the right people. The following are ideas to take into consideration. Fire extinguishers were previously featured on Unclutterer as a very useful unitasker. A multi-purpose fire extinguisher should be located in the kitchen to deal with cooking fires but other areas of the home should have a fire extinguisher, too. An extinguisher for fires involving flammable liquids such as gasoline should be stored in the garage. Cars, boats, recreational vehicles, and seasonal homes should also have fire extinguishers. This is a great gift for anyone who doesn’t already have fire extinguishers, has expired fire extinguishers, or anyone needing an extra fire extinguisher for home, car, or garage. Like the fire extinguisher, a fire ladder is a useful unitasker for those who live in multi-level housing. There are different types of fire escape ladders, and this short video can help you choose the right one for the people on your gift list. This is a great gift for anyone who lives in a house with bedrooms on upper levels or living in an apartment above ground floor. Two-thirds of residential fire deaths occur in homes with no working smoke alarms. Many of us have removed the batteries from smoke detectors because of false alarms due to burnt toast or that annoying “beep-beep” at 3am that indicates the detector’s batteries are dead. 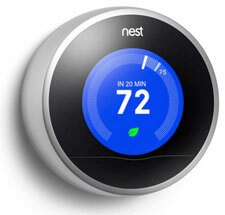 The Nest Smoke and Carbon Monoxide Detector solves these problems. It sends you a friendly, polite alert so that you can take action to prevent a false alarm. It also sends a message to your smart phone if the batteries are low so you can replace the dying ones. This is a great gift for anyone who who doesn’t already have, or have enough, smoke detectors or those who pull the batteries out of the smoke detector on a regular basis. Have you ever left for vacation and realized that you forgot to turn the heat down in your home? The Nest Learning Thermostat will automatically turn your heat down when you’re away and it can be controlled from anywhere by your smartphone. You can turn your heat up as soon as your plane lands and come home to a cozy, warm house. This would be an ideal gift for home owners who are frequent travellers, busy families, or anyone looking to save money on his or her home heating bill. There are several different types of weather stations available but the netatmo weather station connects to your home and allows you to monitor indoor and outdoor conditions with your smartphone from anywhere there is an internet connection. Netatmo monitors your indoor air quality, humidity, and carbon dioxide levels and lets you know if you should increase your ventilation. This is a great gift for anyone who lives in a remote area, far from standard weather stations, or those who want more information that an average thermometer can provide and want that information on their smartphone. A USB charger is technically a unitasker because it only does one thing — charges USB devices. The Elago Tripshell USB World Travel Adaptor is a multi-tasker. It allows you to charge two USB devices and functions as an outlet extender so you can charge your laptop at the same time. And (this is the best part) it works in over 150 countries. If you know someone who travels, this would be a great gift. Your friend can use this device at home and carry it with her on her travels. She will no longer have to carry travel adaptors for every gadget she needs to charge. Since 2007, we have been recommending an extravagant organized gift as part of our annual Holiday Gift Giving Guide. The first year, our ultimate pick was the Fujitsu ScanSnap. In 2008, we recommended the Kindle. 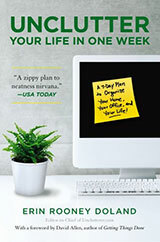 The following year, we suggested my book, Unclutter Your Life in One Week. In 2010, it was the Fellowes Intellishred Shredder (now called the Powershred). 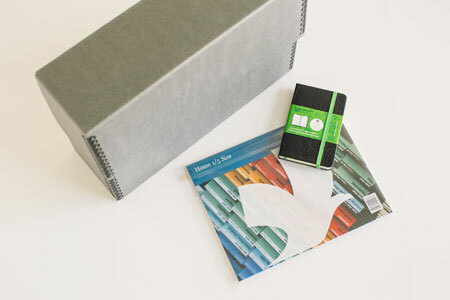 For 2011, our ultimate generosity idea was for hiring a professional organizer. Then, in 2012, it was a closet makeover with Rubbermaid’s Configurations system. All of these suggestions continue to make terrific gift ideas. In fact, we heavily debated if we should have the Fujitsu ScanSnap be our selection again for 2013. However, we decided we should pick something we hadn’t done before. For 2013, we have selected a subscription to Unclutterer’s Quarterly shipments as our ultimate extravagance. It is difficult to put into words the excitement that we feel each time we put together one of these mailings. We know that with each package we are having fun and helping people to be more organized in their homes. 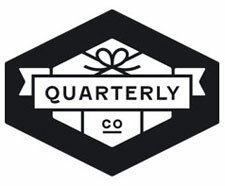 Quarterly is a subscription service that sends out curated packages four times a year, as its name implies. The Unclutterer staff selects the items that go into all of the Unclutterer mailings. We include straightforward directions on how to use/install/manipulate the items. Our assumption is that for every item we send, you will actually be able to subtract one or more things from your homes and offices. Or, the items will help you discover a significantly improved level of organization in your life. Our previous mailings, which you can now give as gifts after the fact, contained solutions for organizing a mess of cables and getting your filing cabinet in order. What we love about these shipments are that if you already have the specific area of your home organized, the items make great gifts to give others to help them on their organizing journey. And, the items we pick for our Quarterly mailings are very positively reviewed, tested, and tried and true solutions to disorganization problems. Do you have a tech-friendly organization devotee on your holiday shopping list? Then you are in luck because this is among the easiest, most fun groups to shop for. A tech geek — for lack of a better term — is always willing to try out a new gadget, system, or tool, just in case it’s an improvement over what she/he is already using. As a tech geek, I’m speaking from experience. The Doxie Flip Scanner. The newest addition to the Doxie family of scanners (released just a couple of weeks ago), is a delightful little device. This portable (about 6.5 x 10 x 1 inches and 1 lb 7.3 oz. ), battery-powered, flatbed scanner is perfect for scanning photos, books, sketches, manuals and so much more. It easily fits into almost any bag and saves scans to an SD card for easy transfer. Here’s a cool tip: If you have a wireless-capable Eye-Fi card, skip the middle man and scan directly to your computer over Wi-Fi. New Trent Travelpak. The Travelpak is a portable recharging device that can supply extra juice to anything that accepts a charge via USB. That means iPhones, iPods, iPads, tablets, cameras and smartphones of all kinds. It stores enough power to keep most smartphones going for a days under normal use. And, it’s barely bigger than a phone, so it fits into a bag or pocket easily. Useful and portable? That’s a winning combo to me. BookBook Travel Journal. 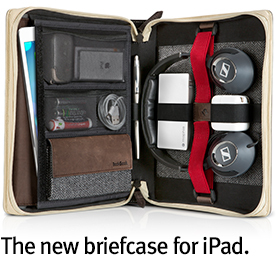 This one is for the iPad-wielding traveler. The BookBook Travel Journal from Twelve South is a tidy, organized, and absolutely fantastic-looking carrying case for an iPad and myriad of accessories. You can store the tablet plus a charger (like the awesome PlugBug), set of headphones, keyboard case, stylus, notebook, and pen. Twelve South makes fantastic products (check out similar carriers for the iPhone, MacBook Pro and MacBook Air) and the Travel Journal is no exception. Tidy, attractive, and best of all, useful. CoverBot Dual USB High Output Car Charger. Here’s another wonderfully unobtrusive device that will keep all your favorite tech geek’s devices charged. The CoverBot Duo is a car charger with two USB-ready ports. Each is fully powered, so you can get two devices up and running at the same pace. 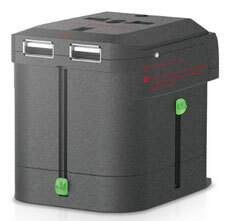 As with the New Trent Travelpak, the CoverBot Duo works with any device that will accept a charge via USB. Philips HF3500/60 Wake-Up Light. Now this is just cool. The Wake-Up Light wakes you up by growing gradually brighter over a 30-minute period. This process, according to Phillips, stimulates your body to wake up naturally, as opposed to the jarring audio alert of most alarm clocks. Phillips sent us one to review and we’re glad they did. 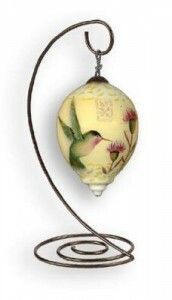 Additionally, once fully illuminated, it easily lights up a bedroom. Replace that lamp and save some space on your nightstand, too. BLaNKcraft Cable Manager. With two iPhones and an iPod in the house, I spend way too much time plugging, unplugging, replacing, or searching for cables. It’s worse when we’re traveling, as one pocket of my bag ends up holding a rat’s nest of white cable. The BLaNKcraft Cable Manager can rescue your tech geek from cable chaos. 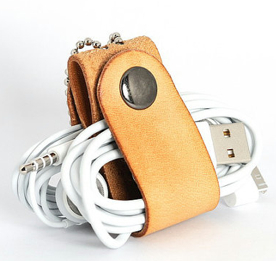 This handmade, leather strap is so simple and so clever that I just love it. 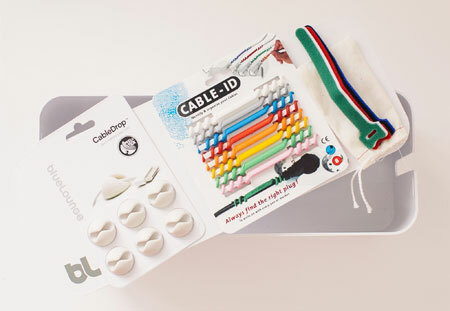 Bind your cables with the snap, tuck it into a bag, pocket, or drawer and you’re good to go. As an alternative, the Cord Taco is another great choice. Tile. This clever little fob attaches to your valuables (up to 10) and lets you track their location with an iOS app. Lose the keys? Misplace a wallet? Don’t know where the kids’ backpacks have gone? You’re a tap away from solving the mystery. Automatic. This is among my top gadgets of the year. The Automatic is a little device that plugs into your car’s data port (check if your car is supported here) and shares a host of useful information. For example, if you car’s “Check Engine” light comes on, the Automatic will tell you what’s wrong via the companion smartphone app (iOS and Android). If it detects an accident has occurred, it notifies local authorities. It remembers where you parked and even helps you drive in a more economical manner. It even supports multiple drivers. The Quirky Plug Hub. Finally, here’s another great way to rid yourself of a rat’s nest of cables. Put a power strip inside and use the three holes in the top to thread six plugs through neatly. You don’t have to look at the ugly plug unit once it’s tucked inside. Take things a step further and add some labels to those plugs so you’ll know what’s going where.